I wrote this analysis and suggestions on interpretation for my friend. I enjoyed to think about how to play this small and popular piece on the stage. This lovely piece just requires sweet sound and relaxed feelings when you play in the bar. But what if you play it in your important concert? You will try to study this piece seriously for your interpretation. 115 measures in slow tempo is not a short piece to understand at a glance, and it would be difficult to give an impressive performance on the stage if you are not well prepared. First, let’s look at the theme shown below. Since Habanera is not based on traditional dances, so there is not much to talk about except the unique and impressive rhythm of base. Chabrier made some features and rules in his theme. The theme is composed by two periods made by 2 phrases each, and has regular style of A-B-A-C.
Then, have a close look at the accents in phrase A.
it has a pattern of [ – – – X][ – – – X][ – – X -][ X – – – ]. Accent marks or ornaments or arpeggios come to the place of X. In the second period, phrase A is the same as the first one, but C has poco cresc. cresc. mark < and decresc. Mark >, and it ends by ppp. It is very important to keep the above expression unless other ones specified. You may feel A has an advancing power, B is quiet, and C is climax. This theme appears 4 times changing their character each time. Play this theme until you get your clear image for this theme. Then, we review the structure of the work and think about an interpretation. There may be several ways to play this 4 measure length introduction. To emphasize the rhythm of Habanera at the first measure or, to keep the same rhythm just before the theme comes in. This really depends on your interpretation. The theme is presented quiet, but your interpretation on the theme shall be clearly shown with effective climax. Theme is transposed by an octave upward. The object is to secure the theme. I do not recommend any ritardando between the first and the second because it may decrease the impact of next period. Here, arpeggios substitute accents. A-flat, first beat of 36 measures, pp would be suitable, for it is after Sf>. 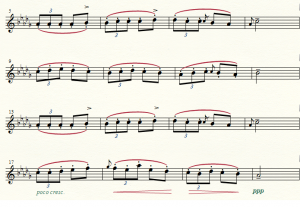 In this part, the rhythm of Habanera is introduced by exaggerated rhythm with sf, f. Then, the rigid rhythm gradually relaxes and become triplets and connect to 6/8 portion which could be played freely with rubato. 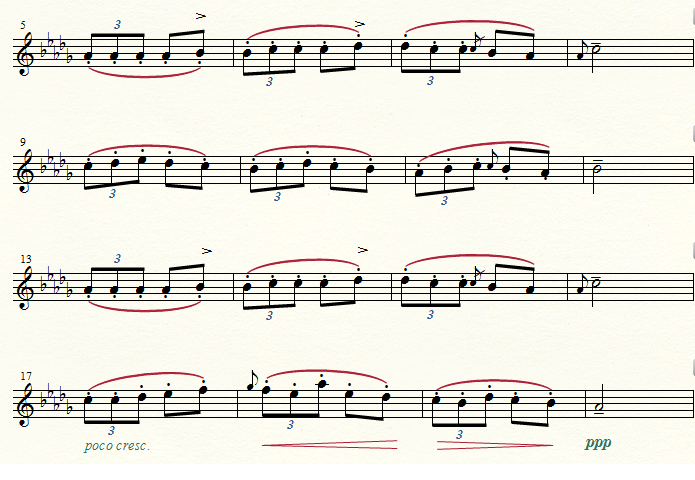 It would be a good idea to keep rubato until measure 49, and return to regular rhythm from pp. This portion is the climax of the work; it looks l the performance before this portion was just the preparation for this climax that is from measure 64 to 67. Then, it moves to connecting portion with lingering imaginary. This part would correspond to the recapture of sonata form. First period [A-B] is ornamented by a beautiful counter melody, and 2nd period [A-C] is tutti by full orchestra. I like to play D-flat with a trill clearly because it indicates the start of Coda. I feel some tremendous downward energy from this first movement of 13th quartet by Beethoven. He apparently has tenacity for 4 descending notes as I will describe in detail here. It seems to be a bit different from his usual attachments to his motives. I guess that his reason is deeply related to the Grand Fugue. As you may agree, Grand Fugue is filled with the continual ascending will and expanding energy. Therefore he has to make an introduction movement which has the clear opposite subjects for contrast. Unique construction of the first movement eloquently speaks that its final movement must be Grand Fugue. First movement is composed by Sonata form but its structure is very unique. This movement is characterized by the first 4 notes of introduction. Fig.1 shows and introduction part. The motive b’-a’-as’-g’ that descends with increasing volume is most important motive that competes with the theme of Grand Fugue and finally yields.